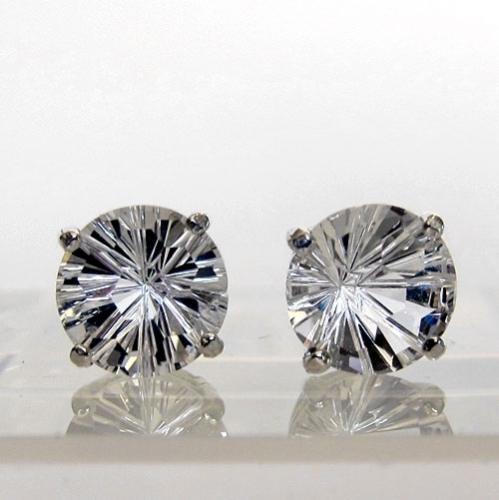 Dimensions (HxWxD): 0.3125" x 0.3125" x 0.3125"
This stunning pair of Super Nova Clear Quartz Stud Earrings is of exceptional quality, both in the cut of the stones and in the simple sterling silver settings which allow the stones to breath and function at their highest vibration. This new stone cut by Paul Jensen of Tools of Evolution line of sacred geometry power cut jewelry originally had no name last year, when we first saw them as pendants. They've been aptly named Super Nova, which describes the radiant energy signature of this complex cut. Both the setting & the wire hangers on these earrings are made of sterling silver. 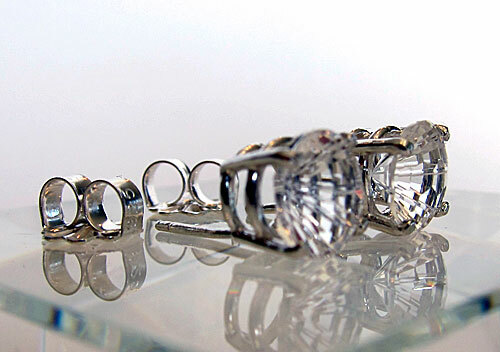 On the back of each Clear Quartz Earring is a modified Millennium Cut, a starburst pattern that was created in the early years of the 21st Century by master jewelers to reflect the emerging consciousness of a new millennium. The surface of the gemstone is laced with an intricate pattern of flat hexagons, like a honeycomb or the eye of a honeybee. The compound eye of a honeybee consists of an array of hexagonal visual sensors designed to maximize the honeybee's ability to detect tiny movements in shadow and in the lower, infrared light frequencies, enabling the honeybee to achieve maximum awareness of predator movements in deep shadow and also provides amazingly acute peripheral vision. The honeycomb is also composed of hexagonal cells, so we call this Super Nova cut the honeycomb cut, and this unique cut is said to help the bearer to bring to consciousness all the information that is normally held subliminally, in the unconscious mind, or which is in the periphery of consciousness and awareness. These Super Nova cut earrings can help to render the bearer much more acutely perceptive, and to enhance the critical spiritual faculty of discernment, which is so vital to us all in today's rapidly changing, tumultuous global environment. Quartz crystals have this marvelous ability because, metaphysically, quartz crystal expresses the unity of the five elements (Earth,Air, Fire, Water, and Ether or Spirit). Crystals grow deep in the earth and form much of the earth’s crust, yet crystals, like the element air, allow light to pass through them. Crystals are fiery in that they have piezoelectric properties yet they are watery in their hexagonal molecular structure which resembles snowflakes, and in their ice-like appearance. Crystals are quintessential expressions of the element of Ether or Spirit, which is synonymous with Universal Life Force Energy, the fundamental energy that sustains all forms of energy in the known universe. These Super Novas have substantial gemological and metaphysical value, have incredible light shining through the violet ray & sparkle! Wear these lovelies to light up your days & nights! Note: Above weight is shipping weight. Net Weight: .1 ounce, or 2.84 grams. Each pair are unique and may vary slightly in appearance. Each pair is guaranteed to be beautiful and to meet with your complete satisfaction!